CANE GARDEN BAY, Tortola, VI – Returned Minister for Health and Social Development Honourable Ronnie W. Skelton on Saturday June 13, 2015 thanked the people of the Second District for supporting overwhelmingly the National Democratic Party and its candidate Melvin ‘Mitch’ Turnbull who steamrolled his way to a seat in the House of Assembly. He said that while some persons might be around that table longer than others it can be attested to that all the voices are listened to and acted upon. During the campaign trail, the Virgin Islands Party was making the assertion that the NDP pays scant regards to the voices of persons such as Fifth District Representative Honourable Delores Christopher and Sixth District Representative Honourable Alvera Maduro-Caines. But this the NDP dismissed as campaign rhetoric. 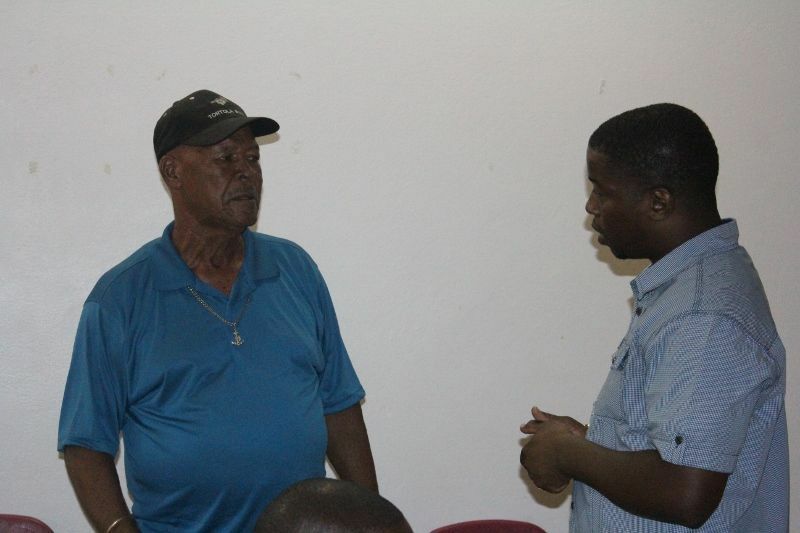 “We now have ‘Mitch’ in the Second District who is now going to bring the views of the Second District and they will be prioritised and acted upon,” he said. 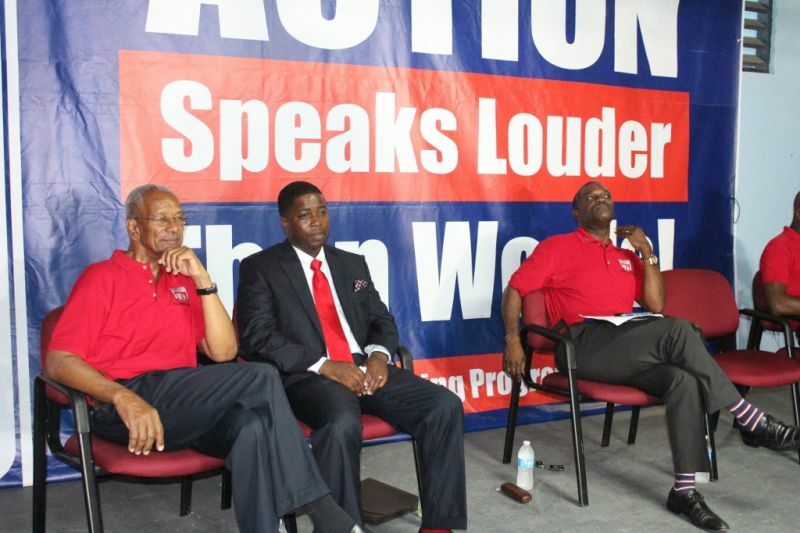 Noting that he has responsibility for health and social services, Honourable Skelton said that he knows ‘Mitch’ is committed to the promotion of these issues in his district and in the VI as a whole. “Again to the people of the Second District, Jost van Dyke, and the people of Cane Garden Bay, Meyers, Soldier Hill, Brewer’s Bay, Ballast Bay, a special thank you and we will not let you down. Let us continue the good work we have started and let us solve some of these issues that are confronting the country,” said Honourable Skelton. 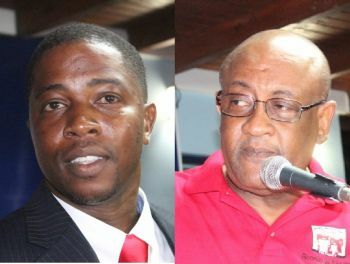 Turnbull won the district by garnering 600 votes over the People’s Empowerment Party (PEP) Elford W. Parsons’ 291 and the VIP’s Rajah A. Smith with 25. Mitch you looking like an old man! He's an old man child. We need a new minister of health--Plain, clear and simple--or alternatively, we scrapt the board and have a Czar or Administrator run the Hospital from the Ministry, Keep the lights on, keep the staff happy, keep the cost down, increase the care and the service---Little is plenty when God is involved--He that loveth the poor can say he love God also.----Excuses to defend something that we know is wrong is not nice, not Godly. The fees are too--daxxxm high. How else can we say it. What the fees are being compared to, to make us believe that they are "too daxxxm high". we are to "keep staff happy, keep cost down, increase care and the services", but how can this be accomplished? who must pay for these things you are asking for? Boss get allya r@$$3$ if haters aint mad you doing something wrong. Mitch for Premier!!! I guess he will steal that election too! Might as well they put Mitch because the rest of them is a no-no. Mitch more a no-no than all of them. Mitch and Marlon will be around for years to come as long as they stick with the people. You are soo.. wrong you did not elect him you Purchased Him. ...or did He Purchase You?? You just got there and now you have your supporters blogging to get him out so that you can take his position, you and the other two Clines under him. WOW! Ronnie old boy, all the clamour about you stepping down would disappear if you would only scrap this darn NHI plan which is no different to Fraser's traffic lights on the round about. The problem is, you will not listen. Should Mitch believe you? How about he scrap the NHI and everyone pays for his/her own health care regardless of the circumstances? You cannot win them all. Ronnie knows that this NHI is a TAX being disguised under Insurance. The truth of the matter is, when this TAX is implemented, 90% of the companies will cancel their employees insurance and for three mths. all Government employees and 90% of the public sector will be without insurance. You are out of work and depending on a little rent from your property? that will be assessed and whether it is rented or not you will pay on the assessed income. NOW, THAT MAKES SENSE? Ronnie needs to go sit down and leave well alone. Myron, please have a word with Ronnie or ask the Manchester lady to speak to him in a language that he can understand. NHI is good--We who have insurance and is happy with our insurance shouldn't have to be forced to leave our insurance-. NHI should be link with Social security--We pay another 2% increase on our social security, we automatically join NHI, we get new social security cards, that shows that we have insurance---If we want to keep two insurance its our choice--I would have two, the one I have now and NHI--I can get the best care I need, when I need--part of healing is knowing you are getting the best care. Not seeing your twin siblings with you celebrating. Those of you who want the NHI cancelled, read the story "T’Shonda Dore" on BVI News. This case it is not a medical emergency, but for some it will be and by the time funds are raised it may be too late. Doli, get lost. Recommendations have been made for her to get surgery through MCH. Let them go after that; they have options. You mean to tell me after screaming that we do not want NHI Ronnie still pushing it? I really do hope that they will listen to you Mitch. I know you have a passion for young people and I hope that you can help them introduce measures that we can use to help our youths. It is sad to see so many of them leaning towards the criminal element. It is sad that we are loosing too many our young men to violence. We need to find a solution and find one fast. Mitch people on here trying to big him up so that they can get raid of Ronnie, Look how they putting down Ronnie! I hope that our government will be there for all of the people of the BVI and not only those who the NDP represent. It will be a gross dis-service if Hon Julian Fraser and Andrew Fahie are not heard and their requests are not met for their districts. Do not let this country suffer because it is not your electoral district. Don't let the Lord punish youall. If you can listen to Mitch, you could have listened to Alvin Christopher. This shows how you guys can be spiteful and vindictive. We all belong here and I beg each member of the House of Assembly to act humbly and justly in every thing you do. 'There is no honor among thieves', you have more faith in these guys than Job. I hope the best for you as you try to but your faith in these Pirates of the Caribbean. I for one want nothing to do with that sinking ship filled with thieves. I have ideas to; what you are putting out there looks like the bate but people be weary, hidden in that bate is the hook. Because of cost and limited financial resources you would be limited to the NHI. At the end of the day, medical personal from the hospital will determine who will be treated at our hospital or who will be sent for treatment at the doctor's hospital on the hill. Presently, we are free to travel to the USVI or Puerto Rico where better facilities are available. Bills are paid without a hassle. Not so with NHI. What we are facing is a Social Government with dictatorial powers.